Before surgeons stitched a kidney from a 32-year-old former Marine into his abdomen in March, Mark Kim spent almost two years on dialysis. He had lot of time to think while hooked up to the machine, three times a week, as it pumped his blood out of his body, purified it and pumped it back in. Sometimes he found himself mulling over how odd it was that a new kidney — the one thing he needed most — was something money couldn’t buy. When his kidneys first failed him, all sorts of people offered to donate one: his neighbor, his two 20-something nieces, two old friends, his sister. But none could follow through, mostly because of incompatible blood types. Such supply-and-demand mismatches can cause prices to skyrocket in a normal market, and indeed, Kim heard hints about the organ’s economic value along the way. Once, at a backyard barbecue, a woman whispered to him that her mother purchased a kidney on the black market for $100,000. Despite the crushing demand, the sale of kidneys is banned in every country in the world except Iran. In the U.S., more than 100,000 people with renal failure are on the list for a deceased-donor kidney, typically waiting between four and five years. Last year, 4,270 people died waiting. Few but free-market absolutists would argue for repealing the 1984 law banning the organ trade in the U.S., but most would agree something should be done to increase the supply of kidneys for transplant. In a sense, though, there’s already a global glut: While we are born with two kidneys, we can function just fine with one. The problem is that they’re stuck inside of us. Kim would have continued to wait on the national list, despite having several willing donors, were it not for a company called BiologicTx. Thanks to its software, Kim was able swap his sister’s kidney for the Marine’s kidney. The Marine, a woman named Liz Torres, gave up her kidney to ensure that her mother got a kidney, which came from a young social worker, Ana Tafolla Rios, who was a better match. Rios passed hers along to secure one for her ailing mother from Keith Rodriguez, a young man from Fresno. He let go of his to procure one for his mom, Norma, a 52-year-old dental assistant with polycystic kidney disease. All these people underwent surgery over two days in March at the California Pacific Medical Center in San Francisco, in what is called a kidney-transplant chain. The software programs driving such chains create something like a marketplace for organs — but one where supply and demand are balanced not through pricing but through altruism. A law-abiding American in need of a kidney has two options. The first is to wait on the national list for an organ donor to die in (or near) a hospital. The second is to find a person willing to donate a kidney to you. More than half the time, such donor-and-recipient pairs are incompatible, because of differences in blood type or the presence, in the donor’s blood, of proteins that might trigger the recipient’s immune system to reject the new kidney. The genius of the computer algorithms driving the kidney chains is that they find the best medical matches — thus increasing the odds of a successful transplant — by decoupling donors from their intended recipients. In the United States, half a dozen of these software programs allow for a kind of barter market for kidneys. This summer, doctors will most likely complete the last two operations in a record-breaking 70-person chain that involved flying donated kidneys on commercial airlines to several hospitals across the country. Each chain starts with a completely altruistic donor, someone who expects nothing in return. In the case of the San Francisco chain, that person was Zully Broussard, a 55-year-old mental-health nurse who works in a prison. Broussard lost her 21-year-old son to bone-cartilage cancer in 2001. Then, in 2013, her husband died of colon cancer. “I know what it is to want an extra hour, an extra day, with someone you love,” she told me. Directed by the algorithm, Broussard’s kidney ended up inside a complete stranger, a 26-year-old factory worker, Oswaldo Padilla, with a 6-year-old daughter, setting off the 12-person chain that included Kim and his sister and ended with an interior designer named Verle Breschini. Economists call an arrangement like this a matching market. “It is not fundamental to economic theory to assume people are selfish,” Alvin E. Roth, an economist who teaches at Stanford University, told me. Roth won the Nobel Prize in economics in 2012 for his work using game theory to design matching markets, which pair unmatched things in mutually beneficial ways — students with public schools and doctors with hospitals. In such markets, money does not decide who gets what. Instead, these transactions are more akin to elaborate courtships. The classic example of a matching market is the college-admissions process. Every year, tens of thousands of students apply to Harvard University. But just because a student wants a spot in the freshman class and can afford tuition does not mean he gets in. Harvard must also wanthim to attend. In the case of kidney exchange, this matchmaking happens at a microcellular level. White blood cells contain genetic markers, proteins that help our immune systems distinguish between our bodies and foreign invaders. The more closely a transplant recipient’s genetic markers match a donor’s, the more likely the body is to adopt that foreign kidney as its own rather than attacking it. All these genetic variables mean that linking unrelated donors and recipients requires the kind of computational heft humans can’t manage with pen and paper. For example, BiologicTx currently has 72 people in a computer database waiting to give or receive a kidney. Run the software to find biologically compatible matches among those 72 people, and you get 105,716 possible configurations — some long chains, others short. Some people in the database have no possible matches. Others, genetically blessed, have thousands of potential matching options within the pool. The software ranks those possible pairings based on hundreds of different immunological, genetic and demographic criteria, while also aiming to create longer chains of harder-to-match people which will ultimately result in more transplants. Last year in the United States, 544 kidneys were transplanted through these paired exchange programs, and many other countries are beginning to adopt them. Surgeons in Poland, Italy and Argentina completed their first chains last year. As more donor-and-recipient pairs enroll, the chains can accommodate increasingly complicated transactions. In December, for example, a transplant surgeon at U.C.L.A. removed the kidney from a grandfather who donated on behalf of his young grandson. The boy suffers from chronic kidney disease, but his doctors have determined he does not yet require a transplant. The grandfather feared that if he waited the five or 10 years until the boy needed the kidney, he would be too old to donate. So the boy and his grandfather joined the National Kidney Registry, using the grandfather’s kidney to kick off a chain, thereby securing a kidney for the boy, who will be the last recipient in another chain at some unspecified future date. Mark Kim had his operation two months ago, and ever since, people have been telling him that his voice seems different, that somehow he sounds more alive. And at a biological level, every cell in his body feels better. But that vitality extends beyond his physical well-being. He is now one link in a visceral chain of sacrifice and benefit. It feels, to him, a little bit like kinship. In 2014, Americans say nurses have the highest honesty and ethical standards. Members of Congress and car salespeople were given the worst ratings among the 11 professions included in this year's poll. Eighty percent of Americans say nurses have "very high" or "high" standards of honesty and ethics, compared with a 7% rating for members of Congress and 8% for car salespeople. Americans have been asked to rate the honesty and ethics of various professions annually since 1990, and periodically since 1976. Nurses have topped the list each year since they were first included in 1999, with the exception of 2001 when firefighters were included in response to their work during and after the 9/11 attacks. Since 2005, at least 80% of Americans have said nurses have high ethics and honesty. Two other medical professions -- medical doctors and pharmacists -- tie this year for second place at 65%, with police officers and clergy approaching 50%. Historically, honesty and ethics ratings for members of Congress have generally not been positive, with the highest rating reaching 25% in 2001. Since 2009, Congress has ranked at or near the bottom of the list, usually tied with other poorly viewed professions like car salespeople and -- when they have been included -- lobbyists, telemarketers, HMO managers, stockbrokers and advertising practitioners. Although members of Congress and car salespeople have similar percentages rating their honesty and ethics as "very high" or "high," members of Congress are much more likely to receive "low" or "very low" ratings (61%), compared with 45% for car salespeople. Last year, 66% of Americans rated Congress' honesty and ethics "low" or "very low," the worst Gallup has measured for any profession historically. Other relatively poorly rated professions, including advertising practitioners, lawyers, business executives and bankers are more likely to receive "average" than "low" honesty and ethical ratings. 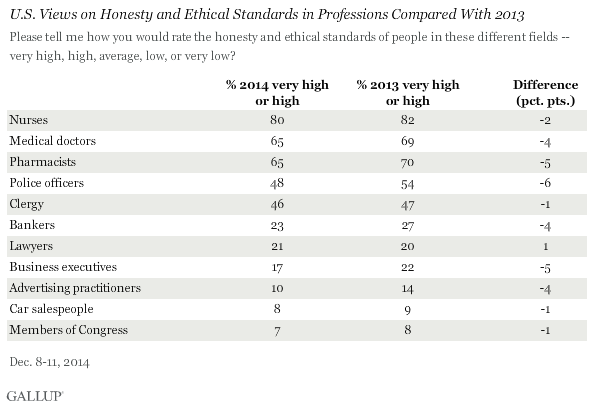 So while several of these professions rank about as low as members of Congress in terms of having high ethics, they are less likely than members of Congress to be viewed as having low ethics. Since 2013, all professions either dropped or stayed the same in the percentage of Americans who said they have high honesty and ethics. The only profession to show a small increase was lawyers, and this rise was small (one percentage point) and within the margin of error. The largest drops were among police officers, pharmacists and business executives. But medical doctors, bankers and advertising practitioners also saw drops. Honesty and ethics ratings of police dropped six percentage points since last year, driven down by many fewer nonwhite Americans saying the police have high honesty and ethical standards. The clergy's 47% rating last year marked the first year that less than 50% of Americans said the clergy had high ethical and honesty standards -- and the current 46% rating is, by one percentage point, the lowest Gallup has measured for that profession to date. 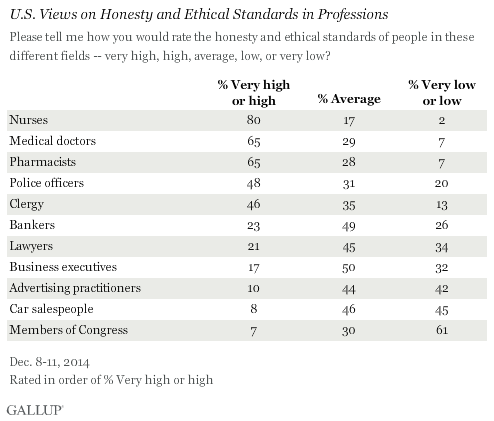 Americans continue to rate those in medical professions as having higher honesty and ethical standards than those in most other professions. Nurses have consistently been the top-rated profession -- although doctors and pharmacists also receive high ratings, despite the drops since 2013 in the percentage of Americans who say they have high ethics. The high ratings of medical professions this year is significant after the Ebola outbreak which infected a number of medical professionals both in the U.S. and in West Africa. At the other end of the spectrum, in recent years, members of Congress have sunk to the same depths as car salespeople and advertising practitioners. However, in one respect, Congress is even worse, given the historically high percentages rating its members' honesty and ethics as being "low" or "very low." And although November's midterm elections did produce a significant change in membership for the new Congress that begins in January, there were also major shakeups in the 2006 and 2010 midterm elections with little improvement in the way Americans viewed the members who serve in that institution. Previously in 2014, Gallup found that Americans continue to have low confidence in banks, and while Americans continue to have confidence in small businesses, big businesses do not earn a lot of confidence. This may be the result of Americans' views that bankers and business executives do not have high honesty and ethical standards, and the fact that their ratings dropped since last year. Results for this Gallup poll are based on telephone interviews conducted Dec. 8-11, 2014, with a random sample of 805 adults, aged 18 and older, living in all 50 U.S. states and the District of Columbia. For results based on the total sample of national adults, the margin of sampling error is ±4 percentage points at the 95% confidence level.